# 38 in our Waikiki map. Hotel Name: .... Outrigger Waikiki Malia Hotel. Address: ......... 2211 Kuhio Ave. When it comes to moderately priced hotels, the Outrigger Malia is a very popular choice within visitors and locals alike. 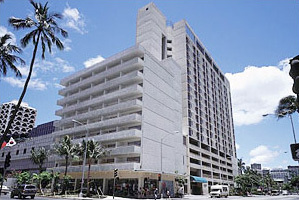 Part of a well established 4 generation Hawaiian based hotel company, it is basically two connected different structures, an older one built in the sixties that sits on the corner of Kuhio and Royal Hawaiian and consists mostly of 1 bedroom suites with kitchenettes and a newer building next to the first one, on the Kuhio Ave. side and built in the 80's that has mostly hotel rooms, the majority of the Outrigger Malia's rooms have balconies. Regarding the common areas, they are adequate for the star rating with a decent size lobby, restaurant, tour desk and shops, There is a small pool and pool area available for guests. This hotel is number "38" within the red zone of our Waikiki map, click here to see it's location in relation to other hotels in Waikiki. This hotel is located in a prime central area of Waikiki, within the red sector of our map. That location places the Malia's guests within walking distance to all major Waikiki area points of interests as well as dozens of restaurants and shops. The Hotel underwent a renovation in 2010 to keep up with the wear and tear. This hotel has a mandatory extra daily "Hospitality fee", that is not included in your room total until you check out. These fees, also known as "resort fees" or "amenities fees", are being charged in several area hotels and range from $10 to $40 extra per day.Noise is a problem everywhere in Waikiki but seems to be particularly accentuated with this hotel, if you stay on the side that faces the street you have the Kuhio Avenue noise, if you stay on the opposite side you have several huge air conditioning cooling towers belonging to the Duty Free shop next to this hotel that run non stop 24/7. 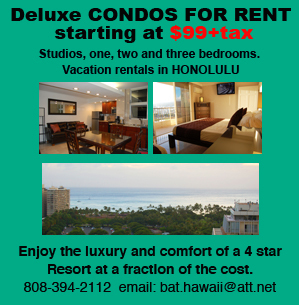 The corner building that has all the 1 bedroom units is kept in great shape but is a little old and the 1 bedrooms are comfortable but somewhat smaller that some people expect, this units fare better when it comes to noise since they are facing Royal Hawaiian Avenue and have no balcony. If you are coming with children, the small pool can be a problem for you, keep in mind however that you are less than 7 minutes away from the ocean. If you are planning to use the beach closest to your hotel, be warned that it is not very wide, you may want to consider going to the beach righ in front of DeRussy park (white colored area in our Waikiki map) since it is the nicest stretch of beach in Waikiki, click here for an aerial picture of this part of the beach.